Troy Brandon Murphy was born May 2, 1980 in Morristown. He grew up in Sparta, in every sense of the word, towering over friends and family and eventually reaching a height of 6’11”. Troy attended Delbarton, a Catholic prep school in Morristown. He was the star of Dan Whalen’s Green Wave basketball team. More than a mere big man, Troy could handle the basketball and score from the perimeter with a silky-smooth left-handed jumper. He was also a fierce rebounder. Starting in his sophomore year, when he averaged 20 points and 12 rebounds, Troy was All-County three years in a row. He was All-State as a junior and senior. In his final season with Delbarton he averaged 33 points a game and led the school to the state quarterfinals. Many college recruiters overlooked Troy because he ran up his numbers against teams from small private schools. The Catholic connection paid off, however, as he was on Notre Dame’s radar. Troy accepted a scholarship and quickly became the star of the Fighting Irish hoops squad. He led the team in scoring and rebounding in each of his three varsity seasons. He was a consensus All-American as a sophomore and junior, and was Big East Player of the Year in 2000. He shared the award with Troy Bell in 2001, becoming just the fourth player in conference history to win this honor twice. Troy decided to skip his senior season and enter the NBA Draft. He was already the only player in school history with 2,000 career points and 900 career rebounds. 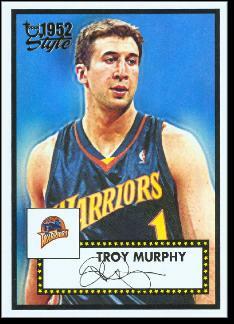 The Golden State Warriors selected Troy with the 14th pick in the 2001 draft. The Warriors worked him into the lineup slowly as a rookie, but by his second year he was one of the league’s best-rebounding forwards. Injuries kept Troy out of the lineup for long stretches over the next few years, but he used the recovery time to increase his stamina and refine his three-point shooting. In 2004–05, he averaged 15.4 points and 10.8 rebounds a game. In 2006–07, Troy became a member of the Indiana Pacers after a midseason trade. He was a starter for the Pacers through the 2009–10 season, averaging a double-double in 2008–09 and 2009–10. Age and injuries reduced Troy to sub status in the years that followed, as he bounced from the Nets to the Warriors to the Celtics to the Lakers and finally to the Mavericks. He played 14 games with the Mavs at the beginning of the 2012–13 season before the team waived him.